PicsArt is so addictive, and Mum, being the addictive type, keeps playing around with it on her iPhone. As for me, well, I let her get on with it. Anything for a peaceful life, eh? 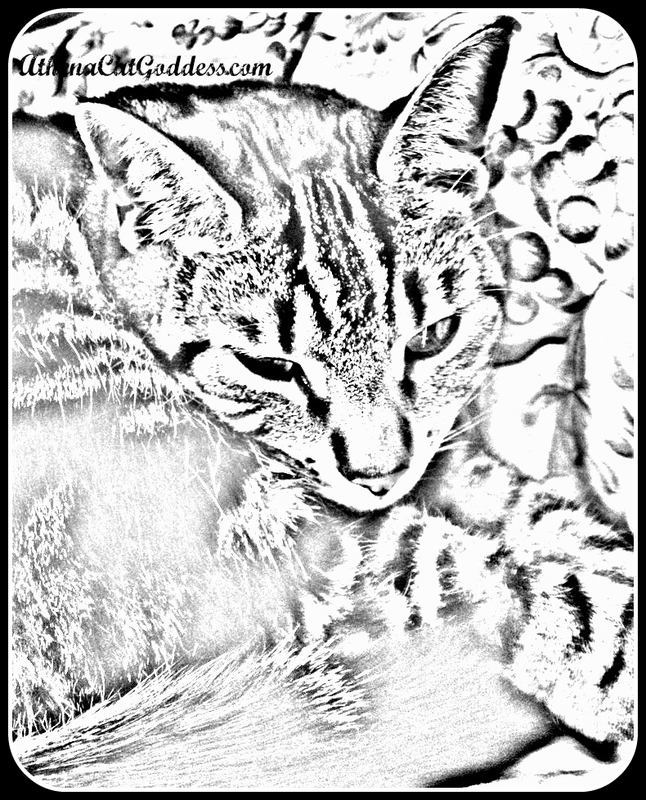 This photo art was created on PicsArt using the sketch effect. Mum then added the border/frame from PicMonkey. You do the most beautiful artwork! I love it! Oh Athena! Yous looks spectacular as a drawing! Beautiful!!! Looks like a charcoal sketch! Very nice.That would make a great iPhone cover! Really like the sketch effect, so pretty! Have a wonderful Caturday! Cool! Love the black and white sketch! Nice picture Athena. You look like an anipal fresh out of Africa. Love it. That’s a good b&w sketch effect. Most of the ones I see make the photo undistinguishable. Our computer harddrives are quickly filling up with the humans playing with art effects. The sketch filter works very well with that photo. Beautiful and unusual image. Thanks for organising this blog hop. Thank you all for your comments. We're are so glad you are all enjoying this blog hop! I hope you had a restful Saturday Athena.